I remember being taught at art college that shadows weren’t really present in paintings until the Renaissance period. And you’d be forgiven for thinking when you look at some beginners work, that they were from Ancient Greece – they didn’t use shadows either! In live painting classes in the past, when I’ve mentioned the words ‘cast shadow’, students concentration wains or worse, a look of rising panic crosses their faces as if they’ve been duped into a technical drawing class. I’m not quite sure why cast shadows seem so mysterious, elusive or confusing. 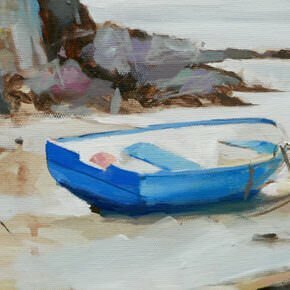 Shadows help to ‘ground’ an object and learning to accurately observe them, is the most effective way of making your paintings look convincing. And just by switching the name around it seems easier to digest. I want to keep it simple without the complications of multiple light sources or atmospheric perspective that occurs in vast landscapes, today I am going to focus on shadows cast outside, by sunlight. Shadows cast by a tree, by a building, shadows cast by a chair or plant pot. The shadow that is falling onto the ground, or against a wall, or onto a table. It can be a really good exercise to look through sun-dappled holiday photos, go outside and walk around your garden or if you live in the U.K. take advantage of the rare heatwave because there’ll be a constant source of clear shadow shapes everywhere and purposely look for subjects to paint where the shadows are the main focus of the image. This will help you to tune your eyes to look for interesting abstract shapes and patterns and begin to notice the interplay of shadows and the surfaces they fall onto. But it’s not just a case of blocking in a black shadow on the ground, there are a few key things to observe that will make your cast shadows appear more believable. The first thing we need to look at is the shape of the shadow. 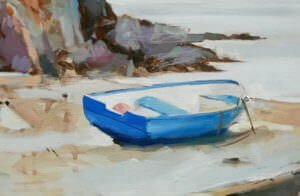 Beginners tend to focus on the main subject they are trying to draw or paint, whereas artists will often look at the shapes around the subject (called negative space) and the shapes being cast by the subject. 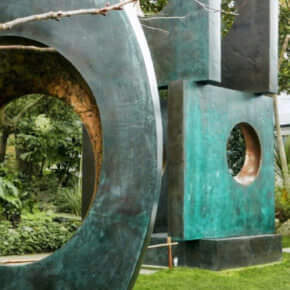 The two most common lighting conditions when painting outside are direct sunlight and a cloudy sky and both influence the qualities of the cast shadow edge. A cloudy sky gives us a soft light source which gives much subtler shadows with soft blurry edges. So you’d think hard light source, hard shadows. 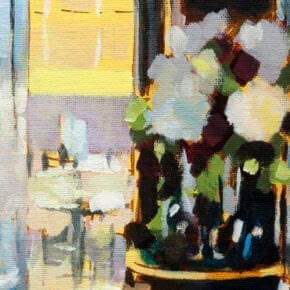 When you’re painting a sunlit scene, the hardness of the shadows cast, alter when you change the distance between the subject and the surface its shadow is being cast onto. In the photo above there is a tree and a plant next to each other, both in direct hard sunlight and we’re only concerned with the shadows cast onto the ground. 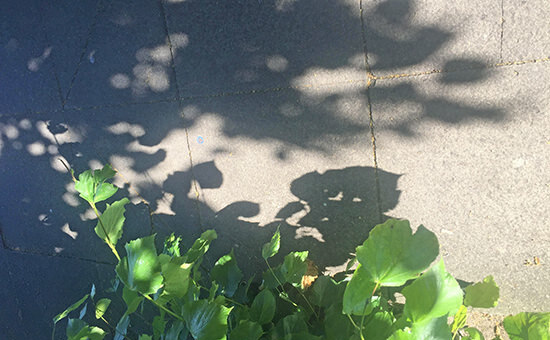 The plant which is closest to the ground has harder and sharper cast shadows than the shadows cast by the leaves of the tree that are further away from the ground. Notice how they’re soft and blurry. 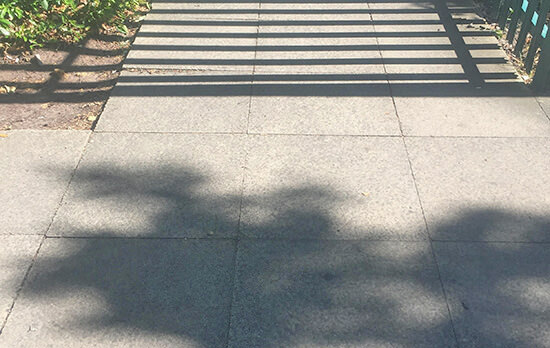 In this photo, again you can easily compare the crisp clear shadow shape at the base of the railings with the soft abstract shadow shape of the tree foliage. Just a change in distance between the subject and the surface its shadow is being cast onto. When I say the word shadow, what’s is the first colour that springs to mind? Usually, it’s black or grey. But actually, cast shadows are the surface they fall onto. You might have heard artists talking about how a cool light source creates warm shadows and a warm light source creates cool shadows. Now, this is technically true but I think it can be a little misleading because personally when I think of cool, I think of a strong blue colour and when I think of warm, I think of a bright yellow or orange. But when you’re observing shadow colours the effect is much, much more subtle. As a general rule of thumb, a sunny day will be a warm yellow light – producing a subtle, blue/violet, cool grey shadow. You have to look closely to try and see the subtle temperature and colour changes. When we isolate the colour of the cast shadows from the jugs above, you can see the purpley hue quite clearly compared to the neutral grey paint swatch on the right. 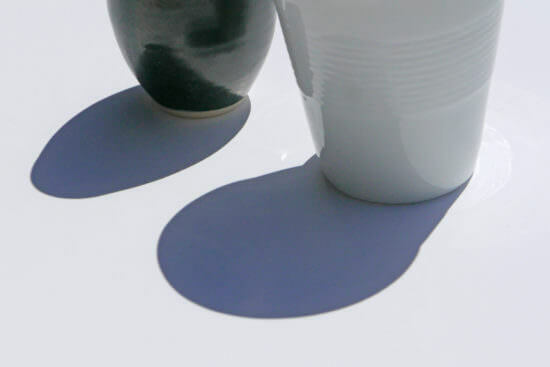 The jugs have been photographed on a white surface, so the shadow colour is in direct response to the colour of the light source. But when cast shadows fall onto a coloured surface, you’ve got to take this into account as well as the colour of the light source. For example, on a sunny day, leaves casting a shadow onto grass would look different to leaves casting a shadow onto a dusty path. You would have the same shadow colour that would be purple/grey initially, (because of the warm sunlight) but then it would be altered by the general colour of the surface that the shadow is falling onto. In this plein air Sargent painting, you can see how he has handled the different cast shadow colours depending on the local colour of the surfaces. 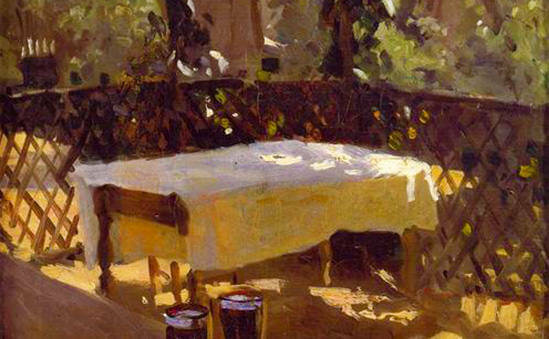 The area of the white tablecloth in shadow is a muted cool pink/purple whereas the floor colour is much warmer becasue of the yellow ochre ground beneath it. Also, there is a small cast shadow under the silver tray in the foreground that it close to a warm Burnt Umber due to the warmth of the wooden tabletop it is sat upon. When you have a translucent object and light can pass through it, like a stained glass window, a thin leaf or oil in a glass bottle. 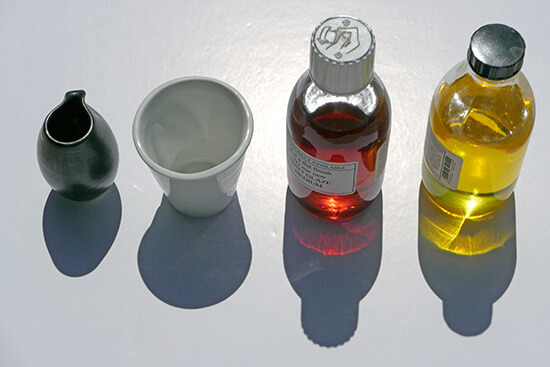 Even in the photo of the translucent oils below, note how the colours at the far edge of all the shadows are all very close in hue. This is because they are no longer being altered by the translucency and the shadows are all falling on the same white surface. When you have a reflective object, like a white porcelain cup and the ambient light reflects off the surface and bounces into the cast shadow. Does the subject have any influence on the cast shadow colour? It can do, but not as much as you think. 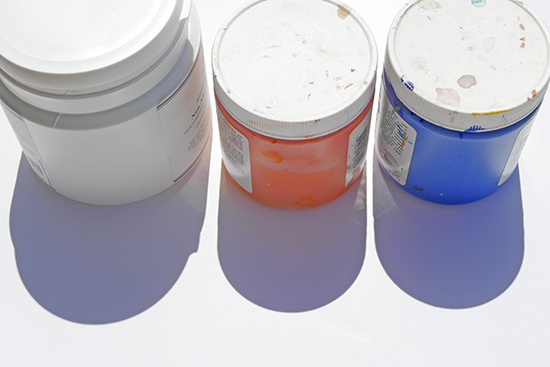 In this example, the colour in the cast shadows reflected from these three paint pots is more apparent due to the shortness of the cast shadow, the brightness of the colours of the paints and the white surface. Mostly, the subject wouldn’t have such an obvious impact. So we’ve observed the shapes, the edge quality, the local colour of the surface and colour temperature of the light source. Finally, we need to observe the value of the shadows, how light or dark they are, also notice how they become lighter in value towards the edges. And because you’re outside, shadows are often lighter than you think due to the sunlight bouncing back into them. Reference photos taken with a phone or camera set to automatic, will almost always over-darken your shadows. A simple remedy is to edit your photos with the built-in software by lifting up the shadows in the ‘shadow’ setting. 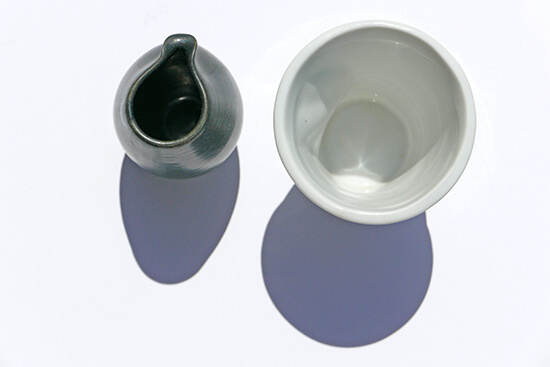 One more thing to remember is that because of the amount of bounced light outside, a white object will reflect more light into its shadows, you can see here how the cast shadow of the black jug is slightly darker. Judging the tonal value accurately is a tricky one! But if you can get it right, it will make your paintings really believable. A good tip is to start with a mid-tone, value 5 of an earth colour that’s sympathetic to your scene. Use this as a starting base when blocking in your cast shadows. 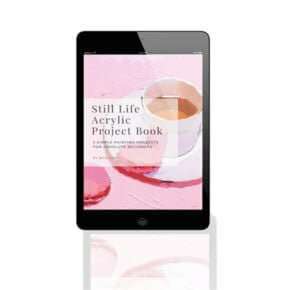 It won’t be perfect, but it will give you a good tone to judge other colours against and as the painting develops you can refine and add more colour, darken or lighten. Step 1 – Observe the shape of the cast shadow. This is in direct response to the shape of the object casting the shadow and the shape of the surface the shadow falls onto. Step 3 – Observe the colour temperature of the light source. Warm light, cool but very muted shadows, cool light warm but very muted shadows and keep it consistent. 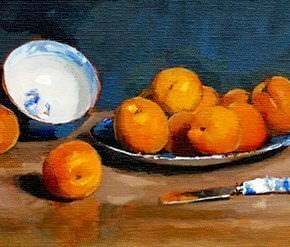 If you decide on a warm light and cool shadow composition stick to that throughout the painting. Step 4 – Observe the local colour of the surface the cast shadow is falling onto. Step 5 – Observe the value of the shadow. If you’re working from a reference image, bring up the shadows. p.s I’m working on a new still life project ebook that will look more closely at mixing and matching the form shadows that make up the second part of the light and shadow puzzle! Thanks Katerina, pleased you enjoyed it. That’s great to hear Kierra, so pleased it helped. Cheers Charlotte, hope you find it helpful. Thanks Will for your usual generous sharing spirit! I LOVED learning about shadows from you Will. I felt my eyebrows go up in the aha moment. Lightbulb flicked on. Big smile happened. You make it so easy to understand! That’s fantastic to hear Karen! nothing like a lightbulb moment to start the day! Thanks so much Will! This is a subject matter I need to really learn. 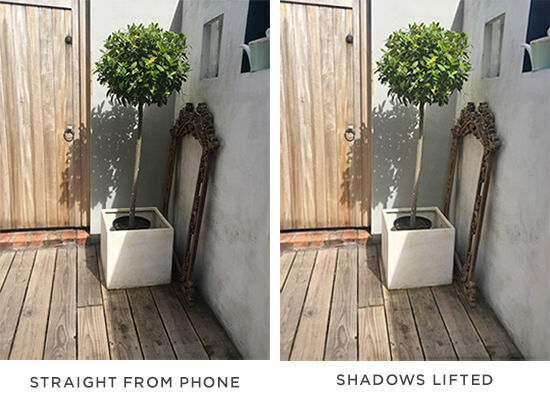 Could you please share what APP you like to use to help adjust shadows? Hi Susan, on most inbuilt camera phots there should be a setting to lift the shadows, on the iPhone if you click to edit the image, then click the ‘light’ dropdown there is a ‘shadows’ tab you can tweak. Snapseed is also an epic app. Out of the blue tips (no pun intended). A very worthwhile surprise, so many thanks Will for keeping in touch. Thanks Gili, hope you find it helpful. So amazing. Thanks for sharing this, Will. And you Coby, have a lovely time. So pleased you found it of interest Kathryn. Great info, Will. Very useful, as usual. Thanks! Cheers Colette, hope you’re keeping well. Thanks Will, this is very helpful information. I have a climbing rose over my patio gate. In the late afternoon there are wonderful cast shadows from the rose bush onto the fence and gate. I have taken some photos and plan to paint it. You’ve given me the nudge I needed. Sounds a perfect subject Lori, really hope it turns out well. Thanks, Will. Deserves another read for the invaluable information. Speaking of heat waves it is currently 33c in Canada. That’s a scorcher Anthony, sounds like the perfect time for a few cold ones! Thank you for another thought provoking article. When I was at art college I remember being told by a tutor that I shouldn’t emphasise cast shadows because they break up the form. I knew that instinctively I disagreed, but at the time I didn’t have the words or knowledge to explain why. Now I know that, yes in some ways they do break up the form but therein lies their beauty. And of course they do describe the form, but in a more interesting way. The beautiful Singer Sargent in your article you have presented says it all. Glad you found it of interest Terry, yes its lovely the Singer Sargent isn’t it. Great lesson and one i know I’ll refer to many times! Thank-you! Thanks Heather, hope you find it helpful. Thanks Will. Valuable and easy to understand. Much appreciated. Glad you found the steps easy to follow Leigh. Thanks Will. Now if I can just remember all of this info. I work in oils both in the studio and Plein Air…. Very helpful information! 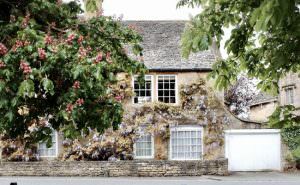 That sounds perfect Sandy, hope you find it helpful on your text plein air session. Brilliant explanation of the variety within shadows. I will never look at that Sargeant painting in the same way again. What is really a pretty ordinary view is brought to life by the quality of the shadows and light on a sunny afternoon. 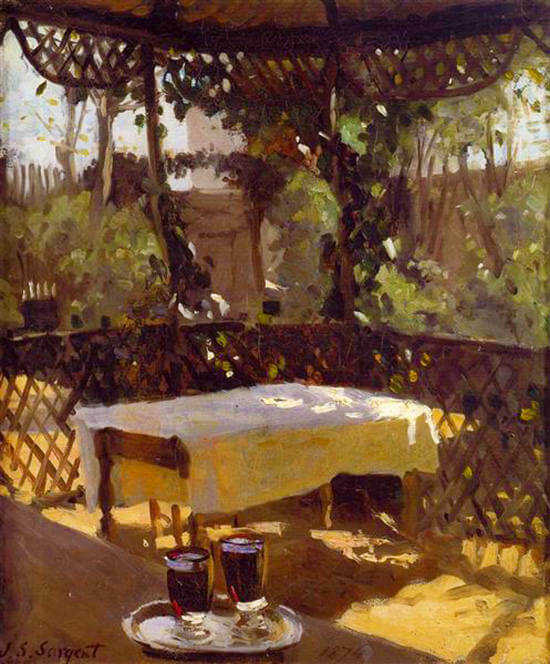 Especially in that beautifully rendered tablecloth which is both translucent and reflective beneath a variety of shadows. Amazing. Thanks for sharing your thoughts and observations. Glad it gave you a fresh insight into the painting Kelly, have a great day. Wow, this is great info! You’ve taken out the mystery of dealing with shadows, thanks Will! So pleased to hear it Janet. 100f here in Pennsylvania – Will – and plenty of strong sunlight! A very timely lesson to help my thinking on this subject – thanks! Well Hilda, with 100f you’re currently in the lead as the hottest student! The absolute best explanation of shadows in one article I have ever read. I have read similar information from many sources, but never information so clearly explained and presented. We have strong shadows here in Australia and suddenly they are looking more colourful and alive. Thanks Will. Well Peter, you’re very kind, what a nice message to receive. So glad you found it helpful and it’s given a fresh perspective to your shadows. Very useful information. But, what happens if a tree cast a shadow into the river? You’ve just got to observe the moving shape more, but the same principles apply. Will you are an amazing teacher and artist. Thank you for sharing your knowledge and guidance of “how to see” and “what to be aware of”. Very helpful and clear information. Thanks Maria, so pleased you found the article helpful. Super helpful! So well explained…thank you! Good one Cindy, so glad you enjoyed it. Thanks so much for the article on shadows. For a beginner like me, it was very helpful to understand what to look for in shadows. Until your description and photo illustration, I would not have noticed the shadows in Sargent’s painting. I will be looking at shadows and paintings differently going forward. A valuable lesson, thank you again. Really glad you found it helpful Karen, and it gave a new insight into Sargent’s painting. Thanks Will. So much good information. I will really be paying attention to those shadows now! That’s great to hear Erin, have fun shadow spotting! So pleased it helped Muhammad. Thanks Will. As usual very helpful insights. Cheers Norbert, hope you’re well. The best tutorial on shadows on the Net! Comprehensive but straightforward. The mark of someone who knows his subject. Well done Will and thanks! Thanks Pat, that’s so kind of you to say so. Shadowing was used in Early Christian/Byzantine art. Example – Justinian and his Retinue in the Church of San Vitale, which was a mosaic. Same for the opposing mosaic of Theodora in the same church (I can’t recall the name of the work right now). Just FYI. I couldn’t help myself. Thank you so much for this lesson, Will. It was so interesting to read it. I have never heard about it. It is great to know. So glad it’s given a new insight into how to approach painting shadows for you Irina. Thanks Will – you amaze me at how clearly you explain things. I’ve always loved shadows but have never seen them quite like this. Now that we have shadows in the UK, I’m going to study them in light of your post. That’s so fab to hear Jennie. Many thanks Will. As always, lots of information which is easy to follow and understand. Thanks to you I now have a great deal reference material to hand, on so many aspects of painting and drawing. Thanks again. Peter B.
Hi Peter, nice to hear from you and really pleased you enjoyed learning about shadow colours. Sounds like perfect timing Paul! thank you for those wonderfull tips. Always learning! Thanks a lot. I just change a painting that hunged for years, now with a different color shadows, it gor character and cohesion. That’s fantastic to hear Eileen, so pleased you found it inspirational to tweak your painting, great work! Pleased you enjoyed it Bernie. Really useful, Will, thank you, I shall defiantly keep this in mind/ file. Cheers John, hope you find it helpful. Getting the correct value and color for cast shadows is so difficult for me. I’m sure with your handy tips (like starting with an earth color value 5) and some practice, I can improve greatly. Good one Kate, really hope it helps when judging the values. Thanks to taking just a few of your classes I have started painting again…now that I am retired. Hadn’t picked up a brush since early 70s! I can’t thank you enough for your teaching skills & support. Still wish you had classes we could fly to the UK and add onto our vacations. Well that’s very kind of you to say so Sharon, that’s brilliant to hear you’re painting again and found the classes helpful to get you started. This was excellent, thanks Will. Off to look at shadows. Good one Suzi, so please you the lesson helpful. Will, thank you ever so much for your help with this subject. So many things to consider on this. My pleasure Barbra, just go through each step one at a time and you’re new shadow spotting skills will start to kick in! That’s great to hear Liz, so pleased its given you more confidence in how to approach the shadow mixes. You must be phychic. I was told that shadows have different colours but I could not find out whether the colour comes from the subject or the ground it falls on and now thanks to you I do. I live in Mallorca so the shadows are very strong as you know and are often the reason for picking a subject.. I am 73 and reading comments from your followers there seem to be lots of us about that age??! Hola Joanna, great to hear that it was good timing for you and it gives a simple framework to work through. Thank you for the great information Will, looking forward to trying out the new tips. . Dianne. Really hope it helps in your paintings Dianne. Thanks Will for more great tips. As soon as the World Cup is over I will try to follow that lesson … I hope in the end Brazil will be the champion…lol. Ha, ha, I will pretend I didn’t read that Ademir, glad you enjoyed the lesson. Thank you for this! It is so helpful for me. That’s fab to hear Susan. And another HUGE thank you. I always work on the surface colour ”minus light” approach. A tablecloth wont change colour because of shadow – it simply a darker colour since the light has been blocked. Many thanks Will, a wonderful clear article on cast shadows. I shall sit in the garden to see how much information I can absorb on this bright sunny day. Love the painting and the quote. My pleasure Carol, so pleased you found the article on interest. What a great post! So simple to understand. I have been so frustrated in the past when I have painted a lovely scene and spoilt it with the shadows. Now I know what to look for. Thanks Will, you are brilliant! Thanks very much Dorothy, really hope it helps to simplify the process when out painting. The topics you cover always bring new thinking into my paintings. Just in time! Thank you so much. That’s great to hear Micki. I tell so many aspiring painters about you. You are the means by which I got started. I appreciate this post so much. So very timely, and as usual, some great new ideas for me to consider. Thanks for passing on the site, much appreciated. Hi Will, thank you for this very informative and easy to understand information on shadows. You are a blessing! Hi Will! Your email has sort of spooked me as I did a google search on painting shadows just hours before it arrived. How did you get inside my head? Thanks for your clear advice – most helpful. Would you have any comments about painting shadows in moonlight? Great to have nice clear information about shadows. Haven’t really understood what I have read before, so hopefully, with practice I will improve. So pleased you found it helpful Mary. My pleasure Kathy, glad you enjoyed it. Good one Kathleen, pleased it helped you to see shadows in a fresh way. Wonderful and informative… thanks, Will ! Good one Ubaid, pleased it helped. Thanks very much Richard, very kind of you to say so. Very useful info Will – great as always, thank you. My pleasure Cheryl, really hope you find it helpful. Hi Will! Thank you for this wonderful explanation! I am a collage artist, but recently went back to painting with acrylic. I used no reference photo for my gestural figure and was confounded how to do the shadowing with a warm golden to crimson background to a foreground of an aqua/turquoise floor. Her sitting position has her hand resting on the floor as well as her blue jeans, and the colors for the shadows were baffling me! I think a warm directly under the hand then out to a cast shadow of the turquoise might work. And a cast shadow of the blue jeans to a violet under the jeans? I will try and see how it goes. Thank you for great articles! So pleased you found the shadow article of interest Kathryn, really hope it helps with your piece. Thanks for the eye opener on shadows. I never realized it was so involved but quite doable for me now. I will keep your e-mail as a referance. Again, thanks much. Great that you’re feeling confident about tackling shadows Jim, so pleased it helped. It is so much informative that I can’t express. Thank you so much. Also not that much easy to grab but at least we got the basic information and idea of cast shadows and its shape, character and colours. As well as how to understand the colour grade. Thanks a lot. Hey Salma, my pleasure, so great that you found it helpful. One of the most thorough and useful descriptions of shadows that I’ve read. Thank you for sharing this information. That’s very kind of you to say so Susan, glad you enjoyed it. Well done Will. Your articles make me look at the world in a different way. That’s fantastic to hear Jim. Thank you Will for being such an amazing teacher. You have a special gift. Your lessons are such a pleasure to read. So concise and easy to follow, with visuals that are amazing. Your lessons inspire us all. Thank you. Thant’s very kind of you to say so Bill, so pleased you enjoyed it. Thanks for this lesson on shadows. I will try to do it better and look forward to your e-book. Really hope it helps Maud. Thank you Will. Great information. I find myself studying shadows wherever I go now. That’s great to hear Bob! This was EXCELLENT!! I will save to review MANY times, I am sure. Cheers Sally, so pleased you enjoyed it. Very informative and enlightening, just like all your other courses. Can’t wait for your new eBook to be published, Will! Let us know when it is out and I promise I will among the first ones who buy and read it! Hey Helen, nice to hear from you, that’s very kind of you to say so, glad you’re looking forward to it. So pleased you enjoyed the article. Great article and very timely as I am going plein air painting for a week in Cypress Hills. So pleased you enjoyed it Teresa, have a great time en plein air! Will you are right about shadows, remember Peter Pan looking for his shadow? Ha, ha very true Mundo! glad you enjoyed it. I appreciate you sharing, good reminder in life. My pleasure Rod, glad you enjoyed it. Brilliant! I am going to print that off for future reference. I do often study shadow colors and try and determine what color they would be painted. Roads and sidewalks are easy as they are basically shades of gray. One question: you mention starting a shadow with value 5 of an earth color. Is this for ALL shadows? 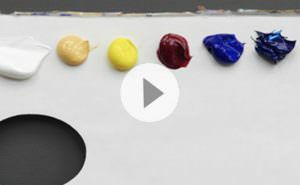 Earth colors to me are raw and burnt sienna, yellow ocher, raw and burnt umber. Are there any I am missing? Hi Patti, no, not for all shadows, just as a general guide for a muted base colour. selamlar…….Gölgeler harikaydı….Ders için minnettarım,Çok teşekkür ederim. Shadows were amazing.Thank You very much Will. Hi Will, I’m Mario from Brazil. Please, don’t stop this amazing work. I’m really learning about painting. Thank you very much! So pleased you’ve been enjoying the site Mario. Will, I truly enjoyed your lessons on shadows; I am so thankful for your clear explanation of the science behind shadows. I work in pastels and just completed a painting based on a reference photo I took in France this summer while on a plain air workshop. How does one infuse a plein air atmosphere of shadows from a photograph? I signed up for your newsletters and other information. Thanks for the sign up Penelope, so pleased you found the article helpful! Incredibly useful information. I’ve taken a number of courses and never have learned this before. Thank you so much!! Glad you found it helpful Caryn, and so pleased you’ve been enjoying the courses. Thanks Will, for fantastic article on Cast shadows. It is another piece of Pure Gold for an Art Student. Such a valuable block of information, to the painter/pastellist it is indispensable. Cheers Andrew, pleased you found it helpful.